You get sleepy while you are studying? It is difficult for you to concentrate on what you are studying? You day dream while studying? Your mind travels from one thing to other? You get distracted easily? You are not able to focus on what you are studying? Sounds familiar ….Chances are that you are lacking concentration and thus are not able to study better. Just like you many students find it difficult to concentrate but before you start worrying, know that this can be improved. 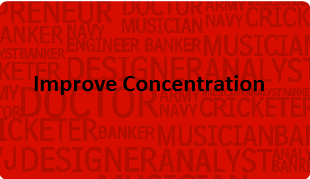 In this blog we will talk about how to improve concentration. At some times all of us are able to concentrate like when we are watching our favorite show or reading our favorite book. At this time we do not notice anything else. The same level of concentration can be achieved while studying also. Concentration is the ability to direct your thinking and it is an art. And since it is an art it can be learnt. It is about bringing the focus and making a conscious effort. Here we will describe some tips and techniques for you to improve your concentration. 1. Where we study: Quite often we can choose the place where we study. And research shows that you will do better in a test if you study in the test environment. So if it is a paper pencil test that will be conducted in the school …you should study on a table and chair and a quiet place. Avoid distractions; face a wall and no music with lyrics. 2. Stick to a routine: You will have to observe yourself and keep into account the Must do’s and have to do’s. You will have to find out which is the best time for you to study and at this peak energy level you must study the most difficult subject / chapter etc. Making a routine and by sticking to it can concentrate better. 3. Vary your study activities: Read, write, solve math / numerical problems, draw, and make projects. Make a time table which has lot of variety and follow it. 4. Study breaks: It is important to take breaks while you are studying but you need to discipline yourself so that break doesn’t extend beyond 10 minutes or the assigned time. 5. Rewards: Some sort of reward for you may be a good idea to reinforce your goal achievement. 6. Health Factors: Some studies have proved that maintaining a good health level is vital for maintaining concentration. A sick body will definitely get tired and feel sleepy while doing any activity. So maintain good health, eat healthy food, follow exercise routine or play some field game to maintain your health. 7. Tell yourself: Whenever your mind wanders you can tell your mind to remain focused and study. 8. Visualize: Think about the time when you were concentrating and got good results. Visualizing yourself deeply concentrated and then begin studying. This will help. These small tips practiced over a period of time will help you improve concentration and also improved results. Get Study Counselling from experts!